What are the first eight item you would buy? 1. A Day by Birger and Mikkelsen blouse. They make these amazing ones, with cotton and silk. So soft, have a nice shine, they are comfy and I wear mine all the time. I would immediately replace it. 2. You need jewelry. I wouldn't by a statement piece, but something I could wear with everything, and still special enough like these 14k mini studs earrings by Ariel Gordon. 3. 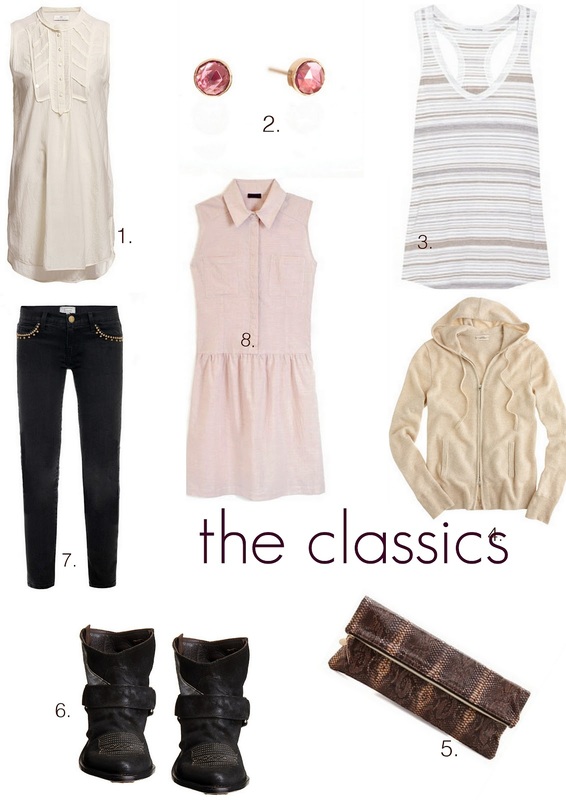 A James Perse tank top. He makes the best ones. Period. 5. My first handbag option would be a clutch. I never bring too much, and a clutch can go from day to night, no problem. This Claire Vivier one, manages to be classic and edgy at once. 6. I live in Golden Goose boots. Normally I wear high ones, but I would buy booties, to also be able to wear them with a dress. 7. I could have filled this whole list with Current/Elliott, I am a big fan. But if I have to choose, I would buy this black pair with studs. You can cover the studs with the blouse and they become clean and stylish, or show them off, and you can forgo any other embellishment. 8. And finally a dress. It would have to be a shirt dress, that is the most flattering shape on me. It is quite versatile, later, you can wear it under a sweater, let the collar pop out, or wear it open, with a cute top underneath. Love, love this Wren one.